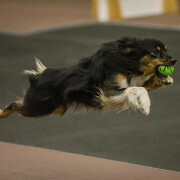 Break out the green sweaters and celebrate Spring a few days early with some Flyball fun as the Weston Whirlwinds host their St. Paddy's Day tournament, March 16-17, 2019, at Canine New England in Walpole, MA. We have great event planned with lots of racing, a raffle, single dog racing, and a great time with all our flyball friends. Send entries to the Tournament Secretary at the address above. Make checks payable to Weston Whirlwinds. Don't forget the special NAFA® hotel rates at La Quinta, Red Roof Inn, and Motel 6. In addition to the hotels listed here, Walpole is only about 40 minutes from Providence and about 50 minutes from Boston, so any hotels north of Providence and south of Boston should be within easy driving distance. Note that these hotels are listed as pet friendly but we have not verified the details of their pet policies. PET FEES/POLICIES ARE ALWAYS SUBJECT TO CHANGE SO PLEASE CONFIRM AT TIME OF BOOKING.